Memory Palace at the Victoria and Albert Museum is a unique, specially-commissioned exhibition of works by various artists, inspired by Hari Kunzru’s novella of the same name. Kunzru’s book tells the story of a dystopian future London, where modern technology has been destroyed by a massive magnetic storm. The resulting century of social breakdown has given rise to a world where independent thought, art and culture are outlawed by puritanical authorities (called ‘the Thing’), in the hope of returning humanity to the simplicity of the natural world. The novella’s narrator is imprisoned for attempting to remember the old world and, locked away without any means of recording or researching, he creates a ‘memory palace’ in his mind using the snippets of images, teachings and texts that he can recall having learned about life before the storm. The exhibition’s artworks bring Kunzru’s narrative to life with illustrations, sculptures, comic-book storytelling and text-based work, capturing the fractured nature of the prisoner’s ‘memory palace’. Némo Tral and Isabel Greenberg‘s prints illustrate the London landscape following the magnetic storm, with landmarks such as St. Paul’s, the Shard, the Olympic Stadium and the Orbit set on fire by puritan fanatics or in advanced states of neglect. Stefanie Posavec‘s graphics are a visual depiction of the philosophy behind the ‘the Thing’; a global web of data abandoned to decay and eventually giving way to the rebirth of a natural, prelapsarian planet. 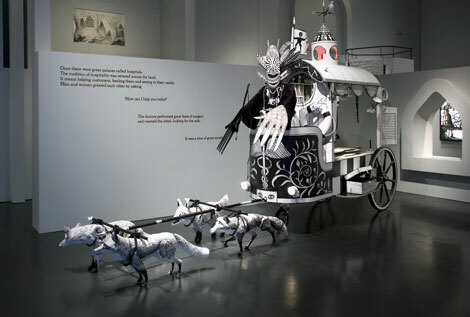 The Le Gun collective’s sculpture of an NHS ambulance, transformed by the prisoner’s faulty recollections into a grotesque, wolf-drawn carriage of superstitious medicine, is particularly noteworthy. The prisoner marvels at a time when ‘doctors performed great feats of surgery and roamed the cities, looking for the sick [,…] a time of great wonder’, giving contemporary audiences a nudge not to take modern social services for granted. Memory Palace is an intriguingly exhibition, functioning as both a celebration of 21st-century life and also a criticism of modern decadence, over-reliance on technology and the possibility of totalitarian, puritanical reactionism. The immersion in a combined world of text and visual art makes for an excitingly unique experience. Memory Palace is similar to last year’s Middle Eastern photography show at the V&A in that, while the Museum is without a doubt increasing its reputation as a destination for massive, commercial blockbuster shows (see David Bowie Is and Hollywood Costume), these smaller exhibitions confirm the V&A’s status as an essential place for new, experimental contemporary art. The exhibition is open until 20 October.